Four Seasons Resort Nevis Closed Until April 30, 2009! Nevisâ€™ Four Seasons Resort will be closed until April 30th as a result of impacts from Hurricane Omar, which passed through the islands of St. Kitts & Nevis on October 15th and 16th . More information will be provided as it becomes available, a statement circulated said Thursday. 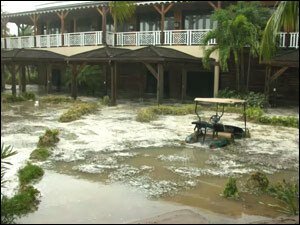 â€œWe are grateful that our staff, visitors and residents of the island remained unharmed during the hurricane,â€ said Andrew Humphries, Regional Vice President and General Manager, Four Seasons Resort Nevis. â€œWe look forward to welcoming visitors back to the Resort and the island when Four Seasons Resort Nevis re-opens its doors,â€ added Humphries. The release said that guests with inquiries are asked to call the Four Seasons Toll-free Reservations line at 1 (800) 332-3442.